Nickelodeon is taking preschoolers on winter adventures in the heartwarming new DVD, Nick Jr: Snow Awesome. Available October 16, this release contains winter-themed episodes of Nickelodeon's popular preschool series Nella The Princess Knight, Sunny Day and Shimmer and Shine. Fans can join Nella on her quest to save Christmas from some naughty snow dragons, watch Sunny work to reunite with Doodle during a snow storm, experience a winter wonderland in Shimmer and Shine's palace and much more. 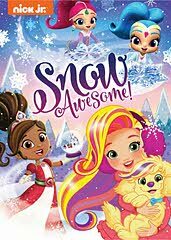 Produced by Nickelodeon Home Entertainment and distributed by Paramount Home Media Distribution, Nick Jr: Snow Awesome will be available on DVD October 16 for the suggested retail price of $10.99. - The Knight Before Christmas: Santa visits Castlehaven on Christmas Eve, but when naughty snow dragons take his sack of presents, it's up to Nella and her friends to save the holidays. - Let it Snow: Nella searches for a magical crystal to make it snow for the kingdom's annual Snow Festival. - Best Christmas Ever: When a snowstorm traps Doodle at his cousin's house on Christmas Eve, Sunny and the gang devise an intrepid plan to trek through the snow and reach Doodle in time to spend the holiday together. - Snow Place We'd Rather Be: When Princess Samira sends Leah and the genies to find a snowflake gem, Zeta interferes making the girls' search much more difficult. - Snow Time to Spare: The girls help Layla, the Ice Genie, create fun snow decorations for the upcoming Frosty Fun Festival. - Frosty Fun: When two trouble-making Ice Sprites slip into Ice Genie Layla's Palace, the girls must catch them before they wreak havoc on the castle.